The weather this week in the Everglades has been perfect. The water temperature has been in the mid 80s, and, the fish have been on the bite! The first spot we stopped at this morning, was a beach front, that had a hard oyster bottom. Within minutes of casting out a live shrimp under a popping cork, we were hooked up with a beautiful snook, that was in the 10 pound range . After catching a few more snook, we headed toward a deep pass, where the tarpon have been coming through. After 15 minutes of soaking a ladyfish, we were hooked up with a tarpon that was in the 75 lb range! We had been putting up a 10 minute fight, when the tarpon jumped, and threw the hook and swam off . 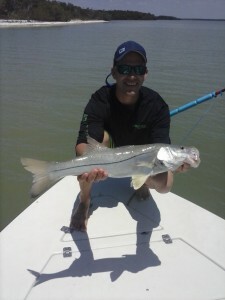 May is one of the best months for fishing in the Everglades! Give me a call and let me get you out on the water for a great day of fishing!